Having fun playing with some of our Moissanite options! Left to right: 8.5mm Forever One Round Brilliant Cut Moissanite from Charles & Colvard, 7mm Single Rose Cut Moissanite from The Harro Gem, and a 7mm Old European Cut Moissanite from The Harro Gem. Here at deBebians we sell all different types of jewelry including diamonds, gemstones, moissanites and more. The sky's the limit here and even if we don't have something on our site, it doesn't hurt to submit a free custom jewelry quote. We can source lots of different gemstones and diamonds and with our jewelry designers and CAD designers, we can design any piece you have in mind. Speaking of custom jewelry, lately we've been getting lots of calls for rose cut diamonds. Have you heard of rose cut diamonds? Well if not, it's good to know about them as to me, they seem to be trending more and more lately. What is a rose cut diamond? In simple terms it's a diamond with a flat bottom and a domed crown. Rose cut diamonds can have anywhere from 3 to 24 facets and date back all the way to the 1500's although when I did some research, that date seems to vary slightly. The rose cut was very popular until the early 1900's when other shapes and brilliant faceting styles emerged. Lately we've seen rose cut diamonds trending and if you check Instagram, I'm sure you'll notice the same. Here at deBebians, we can source you the rose cut diamond of your dreams. In the past, we have sold GIA certified as well as non-certified rose cut diamonds. 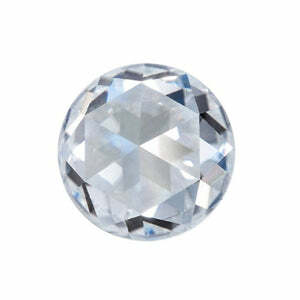 We also carry the Harro Gem rose cut moissanite. Click here to view. /products/harro-gem-custom-single-rose-moissanite If you need assistance sourcing a rose cut diamond and/or designing a rose cut engagement ring, do not hesitate to call on us.